Limonium latifolium (sea lavender) is a member of the Plumbaginaceae family. It is easily recognized by its dense cloud-like sprays of minute lavender-blue flowers. Sea lavender flowers throughout the summer, reaching peak flowering around August and September. Growing up to 2.5 feet tall and 2.5 feet wide, L. latifolium grows best in full sun and when planted in well-drained, slightly sandy soil. 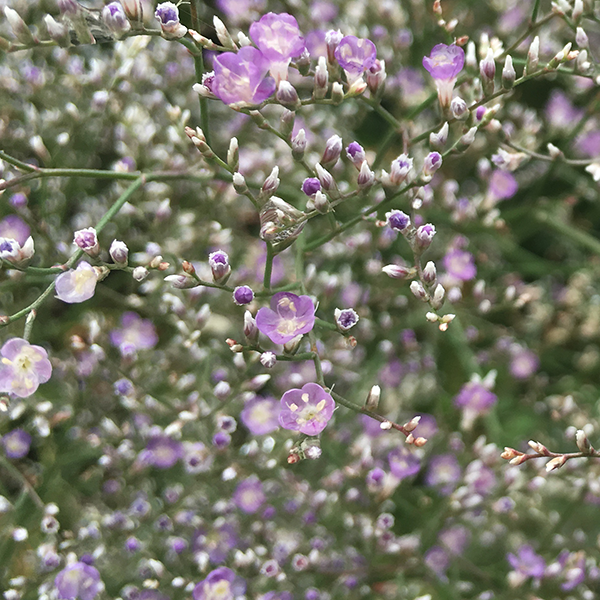 Sea lavender is grown primarily for its floral display; however, its large glossy green paddle-shaped basal rosette leaves form an attractive grown-cover from early spring until summer flowering. At Lurie Garden, the fine texture of L. latifolium inflorescences are often used as a backdrop for taller, rougher textured plants such as coneflower (Echinaceae), switchgrass (Panicum), or Russian sage (Perovskia atriplicifolia). Sea lavender can also be used as a stand-alone plant when an interesting yet soft texture is desired along the border edge of a garden.